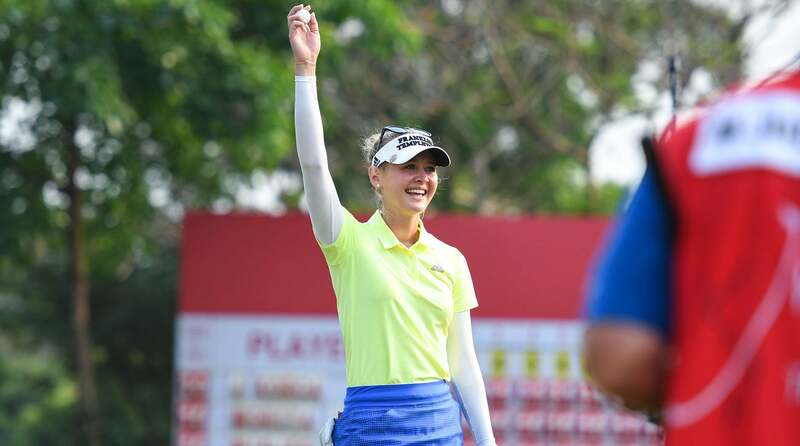 CHONBURI, Thailand (AP) - Florida's Jessica Korda set a tournament record to win the LPGA Thailand at the Siam Country Club Pattaya Old Course on Sunday. Korda held off Lexi Thompson and local hope Moriya Jutanugarn for a four-stroke win after a final-round 67 for an overall total of 25 under 263, smashing the previous mark of 22 under set by Amy Yang of South Korea in 2017. "It's an incredible thing to be able to win again. I haven't won in two years. And who knows? It's so hard out here. These girls are so good. I mean, look at the scoreboard. I had to shoot 25 under just to win," said Korda after claiming her fifth LPGA win. It was Korda's first trophy since winning in Malaysia in 2015. Ranked No. 26, Korda had surgery on an overbite in December and was playing in her first tournament since November. Thompson, who won here in 2016, turned in a bogey free round that included eight birdies to sign off with a 64 for a 21 under 267. "I had to just fire at everything today and make a lot of birdies because Jessica has been playing amazing, along with a lot of other people. So that's what I did. I just went after it," said No. 4-ranked Thompson. Moriya, the 2013 Rookie of the Year, almost caught up with Korda after nine holes when she closed to within two shots, but her challenge faded and she failed to become the first Thai winner of the tournament. Moriya finished with a final-round 67 for an overall 21 under 267. "I wasn't sad at all. It was fun playing with Jessica. It's been a fun week. I already tried my best. Whatever happened this week is cool," said Moriya, who has yet to win on the LPGA tour.